It is on this Mahavamsa document that the Sinhalas base their exclusive claim to possession of the whole island. They say that it is ignorance of Lankan history that makes the Tamils demand power-sharing and the foreigners talk of a federal solution to the ethnic problem. Many non-Sinhalas are baffled by the so-called historical claim of the Sinhalas. How exactly has this historical claim of the Sinhalas been established? Many Sinhalas are either not willing or not capable of distinguishing myths from facts in a critical study. The Sinhalas use the same word itihasaya to indicate both epic and history and that could be one of the reasons for their difficulty in distinguishing fact from fiction. Mahinda Rajapakse says that 1956 is back all over again. 1956 was the year when S.W.R.D. Bandaranaike ushered in Sinhala hegemony in Lanka. It was the year when Sinhala mobs attacked the Tamil leaders who were engaged in peaceful protest and shouted ‘ape aantuva’, equating Lankan government to Sinhala government, effectively denying the Tamils a share. Even though the slogan of ‘Sinhala Only’ was said to be about making Sinhala language the only official language of the country, steps soon followed which made for Sinhala hegemony and then Sinhala Buddhist hegemony in most other areas as well. Fifty years later, in 2005, the Sinhala electorate gave a similar verdict, in electing Mahinda Rajapakse as the President. The turbulent half century period in which the country, as well as the Tamils, suffered so much agony has not made any effect on the Sinhala psyche. How is it possible for the Sinhalas to be so intransigent? Scholars, analysts and politicians have identified the 'Mahavamsa mindset,' about the Sinhala Buddhist claim to the island of Lanka, as the reason why most of the Sinhalas cannot be rational and liberal. Therefore, it is necessary to study critically the Mahavamsa as a source of Lankan history to understand the ethnic conflict between the Sinhalas and the Tamils. This article will confine its attention to the myth of origin of the Sinhalas as found in the Mahavamsa and the Sinhala transformation of Buddhism, a universal religion, into a narrow ethnic religion. Sinhala Buddhists have preserved some historical material in the form of ‘vamsa’ texts, some of them from ancient times in the Pali language and some others from later times in the Sinhala language. Of these, the Mahavamsa in Pali is very important. Modern scholars characterize the Mahavamsa as a chronicle. It was a document of the Mahavihare monastery of Theravada Buddhism. There was a chronological framework and what the Sinhala rulers did - whether good or bad - has been noted, mainly from the point of view of the Mahavihare. The earliest portion of the Mahavamsa (only this portion of the long chronicle is referred to as the Mahavamsa by some scholars; they refer to the subsequent portion as the Culavamsa) was composed by Mahanama, a Buddhist monk in the sixth century ACE. This portion of the Mahavamsa tries to trace the beginnings of Sinhala Buddhism from the sixth century BCE to the end of Mahasena’s reign in the fourth century ACE. There was the Dipavamsa, a Pali chronicle dealing with events of the same period, already in existence, but Mahanama found some shortcomings there. He wanted to improve and elaborate on the Dipavamsa. He referred to Sihala Attakatha as the original authority from which he obtained his material. Even though nothing more is known about this Sihala Attakatha, he must have had some other sources also, besides the Dipavamsa. Sihala Attakatha was notably influenced by the Indian Epics and Puranas. Early material about the Buddha and his teachings had been collected in the Pali Canon by about the first century BCE. The Pali Canon is available now. Voluminous material is available about the Buddha’s life and his teachings. The Buddha’s travels and teachings, from the time of his enlightenment when he was thirty-five years old to his death when he was eighty years old, his criss-crossing the Gangetic valley mostly in present day Bihar, eastern Uttara Pradesh and maybe western Bengal, coming across a cross-section of all groups of people, varying his teachings to make them appropriate to different occasions, are matters that could be gleaned from the Pali Canon. There is no evidence that the Buddha had heard about the island of Lanka. In fact, except for probably a later identification of Lanka mentioned in the Ramayana, there is no evidence that the present day Sri Lanka was known as Lanka at the time of the Buddha. Even in ancient Tamil, the island that goes by the name of Sri Lanka now was known as Ilam (=Eelam) and not as Ilankai. The message of Buddhism was universal. There is no indication that it was parochial. The Mahavamsa has transformed the Buddha into a special patron of Sinhala Buddhism, an ethnic religion. The enlightenment of the Buddha seems to have involved realization of some truths about worldly life and about how to transcend that life. The Mahavamsa Buddha had tremendous foresight into the long term future of the world. He knew that his teachings would be preserved in purity only in Lanka in the distant future. So he decided to prepare the ground by making three visits to the island. This is how the Mahavamsa begins and the beginning of the Mahavamsa is clearly a historical fiction. Early Buddhism has given the Buddha, another title - jina, ‘conqueror.’ What it seems to refer to is Buddha’s disciplined life, controlling his senses and resisting temptations and, perhaps, his converting a large number of followers. But the Mahavamsa Buddha appears to be a real conqueror, imposing himself on the others, in the usual sense. When the Buddha made his visits to the different sites in Lanka, those sites were said to have been occupied by Yakkhas and Nagas. There is some controversy about identifying these groups, but they must have been different tribes or communities as modern day archaeologists report that human beings have been occupying the island for many thousands of years. The first visit of the Buddha was to the Mahiyangane area where Yakkhas lived. The Mahavamsa Buddha did not try to win them over with his compassion, as the original Buddha would have done in similar circumstances. He terrorized the Yakkhas by manipulating natural phenomena. The Yakkhas appealed to the Buddha not to terrorize them; if they were not harmed, they would vacate the land for the Buddha. The Mahavamsa Buddha seems to have taken on a character which the original would not have recognized. 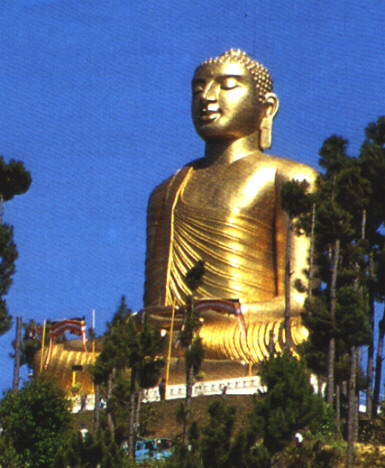 The second visit of the Buddha was to Nagadipa, now identified with the northern part of Lanka. Two Naga princes were about to fight fiercely for a gem-set throne and bloodshed was imminent. The Buddha made his visit to prevent bloodshed. There, too, the Buddha seems to have used methods of manipulating natural phenomena to frighten the princes so that they themselves offered the Buddha the throne out of fear. The third visit of the Buddha, according to the Mahavamsa, was to Kelaniya at the invitation of a Naga prince who had met the Buddha during his second visit. It was on this visit that Buddha was said to have left his footprint on Adam’s Peak. Vijaya and his followers, the ancestors of today's Sinhala community, are said to have landed on the island of Lanka, on the date of the Buddha’s passing away. According to the Mahavamsa, the Buddha had to make arrangements for the safety of Vijaya and his followers. He calls on Sakka (=Indra), who in turn calls Upulvan (=Vishnu?) for divine intervention for help. When Vijaya and his followers landed on the island, Upulvan assisted him. If Buddha was taking such a personal interest in Vijaya and his followers why were they not Buddhists when they were said to have established their kingdom? Soon after arrival, Vijaya and his followers were among the Yakkhas. What happened to the Nagas who had been so friendly to the Buddha just about thirty-five years before Vijaya’s landing? The Buddha could have directed Vijaya to the Nagas. It is strange to note that the Mahavamsa does not refer to any contact between Vijaya and the Nagas. How could Vijaya become king of Lanka, if he had not even made contact with the Naga areas in the northern and western regions of Lanka? This portion of the Mahavamsa appears to be a super-imposition of a myth to the main narrative of the Mahavamsa; it does not make for a connected story. According to later chapters of the Mahavamsa, Buddhism was introduced to the island about two centuries later. The Buddhist monk-author does not seem to have noticed the contradiction. Asoka, the famous Magadhan emperor, took the initiative to send Buddhist monk missionaries to Lanka. Tissa, his friend, was said to be ruling Lanka. The Mahavamsa gives the impression that Asoka cared very much for Lanka and gave special attention to it. First he sent Mahinda, his son, who had become a monk, for the purpose of propagating Buddhism in Lanka. Mahinda was on Mihintale hill when Tissa met him. Mahinda is said to have conducted tests on Tissa to find out whether he could comprehend Buddhism. When one reads this portion of the Mahavamsa, the question arises how far Asoka and Tissa could be friends and how much Asoka knew of Tissa. The Sinhala Buddhists do not question these passages because it is in their interests to hold on to the myths. How can Sinhalese Buddhists expect non-Sinhala Buddhists to swallow these myths as historical facts? Asoka was a great emperor who was well-respected in India and elsewhere. He left many inscriptions, from which his greatness could be deduced. He proclaimed dharma – which seems to be the core of many Indian religions- in most of his inscriptions. Modern historians give much more weight to contemporary inscriptions issued by the ruler himself than to chronicles, written many centuries later by sectarian monks with their own agenda to promote. The Mahavamsa makes Asoka a zealot of Theravada Buddhism. The Mahavamsa tradition narrows down Asoka’s perspective as it has narrowed down the Buddha’s perspective. Claiming that the whole island of Lanka belongs to the Sinhalas is another of these narrowing downs of the Buddha and Asoka's ideals. It is interesting to note that, according to the Mahavamsa, the Buddha wanted to provide for the safety and well-being of Vijaya and his followers, as he knew that his teachings in all its purity would endure only in Lanka. A study of the Buddha from early sources does not indicate that this kind of clairvoyance was part of the Buddha’s enlightenment. It is important to note the character of the people who founded the community, as described in the Mahavamsa. 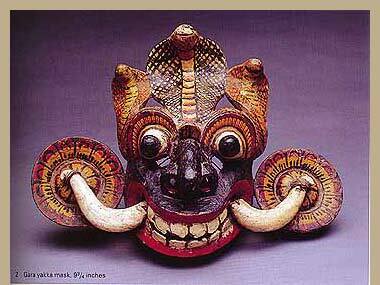 Vijaya’s grandfather was a lion. This lion cohabits with a Bengali princess and begets two children. The son of the lion escapes with his sister and mother from the den of the lion. When a king offers a big award for killing the predatory lion, the son kills his father and accepts the award. The son of the lion marries his sister and begets many children. Vijaya was the eldest son of this couple and he seems to have inherited all the evil genes of the two previous generations of his ancestors. People of that part of Bengal were so much harassed by Vijaya and his followers that his father was forced to exile them by putting them on a boat and pushing them into the sea. After many days of sailing, they were said to have landed at Suparaka, a port on the northwestern coast of India. What is important to note here is that Vijaya and his followers were found to be so troublesome that they were chased away even from Suparaka. Descendents of people who were chased out of both the eastern and western coasts of north India are in control of Sri Lanka and are now appealing for help from India to maintain their hegemony and to deny Tamils their rights! A study of how Vijaya and his followers established the first Sinhala kingdom reveals much about the character of the Sinhalas. Upulvan, the guardian deity, received Vijaya and his followers to fulfill Buddha’s wishes and gave them protective threads tied round their arms to protect them from harm. Vijaya met Kuveni, a Yakkha, who could be described as a daughter of the soil (bhumiputri !). She falls for Vijaya; Vijaya marries her and they beget two children. As the Yakkhas will not accept Kuveni marrying a foreigner, Vijaya, with assistance from Kuveni, massacres them, taking them unaware, when they were attending a celebration. The extent of destruction of the Yakkhas seems to have reached the point of genocide. The Mahavamsa does not say that Vijaya and his followers made any peaceful accommodation with the Yakkhas, the indigenous inhabitants. Vijaya and his followers started a new community, marrying people from India and thus bringing new settlers. In this context, it is very amusing to see some Sinhalas claiming that they were ‘sons of the soil.’ The Sinhalas were a people who committed the genocide of the ‘sons of the soil’ according to their own origin myth! Vijaya and his followers decided that Vijaya should marry into a royal family to confirm his royal status. They sought out a princess from the Pandya royal family of southern Maturai and sent emissaries with valuable presents of pearls and gems. The Pandya king is said to have sent a princess, as well as many women for Vijaya’s followers. Vijaya must have used Kuveni's connections to obtain access to Lanka’s resources of pearls and gems. But now, he was getting married to a high class lady and he did not want to have Kuveni and her children around. He betrays Kuveni. In spite of pleadings from Kuveni, she was exiled to the jungles, along with her children. Remembering her betrayal of her Yakkha kinsmen, the Yakkhas kill her. With such an urumaya (inheritance), how can the one expect justice in a Sinhala-dominated country? The Sinhalas claim that they preserve pure Buddhism, by which they seem to be referring to an early form of Buddhism. But many Sinhalas are not interested in Buddha's teachings. Not many are even interested in practicing Buddhism. What we witness is a kind of political Buddhism trying to promote the interests of the Buddhist people, rather than religion as a path for personal salvation. What the Buddhist people seem to care for is celebrating the outward trappings of Buddhism. Many scholars consider the Buddha’s first teaching at Sanchi, after his enlightenment at Bodh Gaya, of the ‘four noble truths’ as the essence of early Buddhism. The first noble teaching is that life is suffering. The Buddha defines suffering very broadly to include what are considered pleasurable activities also, as pleasures, when there are no ends/ limits, lead to suffering. Probably not understanding the nuances of this truth, the Sinhala Buddhists are bent on teaching the Tamils that life in Lanka is suffering without end. In South Asian origin religions, it is a common belief that Death (=Yama) and destruction come from the Southern direction. Sinhala South Lanka has been actively bringing death and destruction to Tamil North Lanka. The second noble teaching of the Buddha deals with the cause of suffering which he ascribes to the law of karma. Karmas arrive and accumulate, due to what the Buddhists call the ‘three poisons’ of desire, hatred and ignorance. When JHU monks speak and act, it is amazing how all these ‘three poisons’ are blended together. Ignorance of how ethnic problems like ours are solved in other countries, desire for Sinhala Buddhist hegemony over the whole island and hatred of the Tamils are the hallmarks of JHU politics. The third noble teaching of the Buddha regarding nirvana/nibbana, “cessation”, also seems to have been misunderstood. Sinhala Buddhists seem to understand that killing Tamils means some kind of cessation of the Tamils and so this is acceptable behavior for them. A considerable section of the Tamils have run away and are continuing to run away to escape the Sinhala Buddhist military assault. A second section of the Tamils is fighting to establish a separate homeland for the Tamils in Lanka so that they can live normal lives as free human beings in a secure environment. But many Tamils in Lanka continue to live in dread that they might face death and destruction at any moment from Sinhala armed forces and paramilitaries. Do the Sinhalas accept the early portion of the Mahavamsa as history? If this is history and if this is what they are proud of, it is very difficult to be optimistic about the future of the country. Even if it is just myth, myths exercise lot of influence on people who take them seriously. Some critical studies of the 'Mahavamsa mindset' could induce Sinhalas to take the myth less seriously; it could also help the Tamils and others to understand the straitjacket thinking of the Sinhalas.